Add the Ruff Sawn Muskoka Four Piece Bedroom Set into any room and be rewarded with endless nights of sleep in the comfortable bed and ample storage space with the case pieces included. 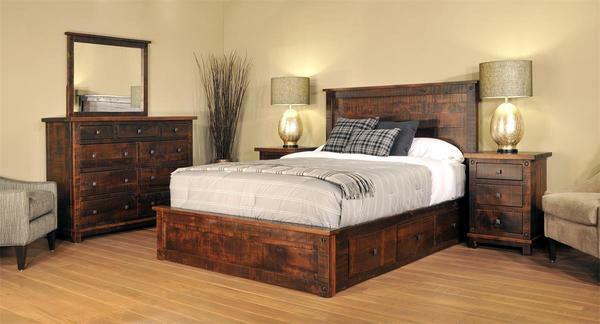 Get one bed, two three-drawer nightstand and one nine drawer dresser with this Amish bedroom set. 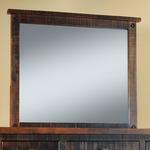 Add under bed storage and a matching mirror for the dresser as shown to really make a statement in your bedroom suite. The six drawers if added will provide you with extra storage space in one location that you can use for storing pillows, blankets, bedding, suitcases and other items. Sold as shown in rough sawn wormy maple wood and the finish color of your choice, this solid wood bedroom set will add a rustic style to your suite that you will be able to enjoy for a lifetime.